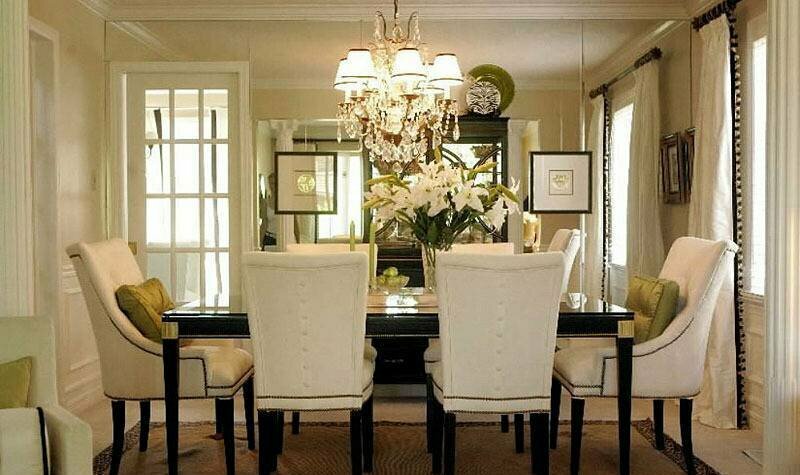 To get the right size chandelier for your dining room you will need to get the overall diameter of your room. For example if your room is 12ft. X 16ft. the diameter of your room is 28ft. in diameter. Convert your measurements of feet to inches and you have the size of chandelier you will need for your room. So for a 28ft. diameter you would need a 28” inch chandelier in diameter. The correct height to hang a chandelier in the dining room is around 30-38” from the table on an 8ft. ceiling. If your ceilings are higher than eight feet you can adjust the height so you’re not looking directly at the bottom of the chandelier when you’re sitting down or standing up. For larger ceilings 10 feet and up consider a larger size chandelier with 2 or 3 tiers to fill the space and have it looking more in place. Take into consideration the size of your dining room table, you don’t want an oversized chandelier that may hang over the sides of the table. If the room is larger and the ceilings are higher you may choose to go with a larger chandelier, have it hung higher treating the room more like a foyer. Lighting a dining room table can make or break the overall setting and “feel” of the room. Generally above the table your going to want to have 1 or 2 potlights on each side of your chandelier. To avoid glare from high wattage bulbs use shades or dimmers. These potlights will brightly illuminate china and crystal components and the chandelier can be dimmed to your liking. This will make your centrepiece or chandelier stand out and the light will illuminate through it giving it a great look. Wall sconces should be mounted an average of 5ft. 6” inches from the ground depending on the size of the sconce. For bathroom and vanity they should be mounted above or beside the mirror so shadows on your face from overhead sources will be eliminated. If you’re placing wall lamps beside the bed they should generally be 24”inches above the mattress surface. If you reside in a house with larger foyer like ceilings and are looking to add a rather large luxurious chandelier here are some tips. If you a looking at a piece that has an abundance of crystals and care to keep it looking great and clean it once every month or so, invest in a motorized chandelier lift. This is a great tool to save you money on hiring someone to clean your fixture and lets you take care of your investment. It also makes it easy to change your lighting rather than hiring someone again to do so. The motor assembly is mounted above the ceiling usually in the attic and is not visible. They may be installed in new or existing homes. For maximum safety the electrical current is disabled from the fixture once it’s lowered. The supplied key switch prevents accidental use and protection from children using it. The lift includes a test plug which allows you to plug in the fixture to a wall outlet to identify which bulbs need to be changed. A dimmer may be used as long as the motor is wired separately. This can be a very frustrating thing for home owners trying to choose lighting elements and fixtures. The power supply can be placed anywhere along the rail which solves the problem. 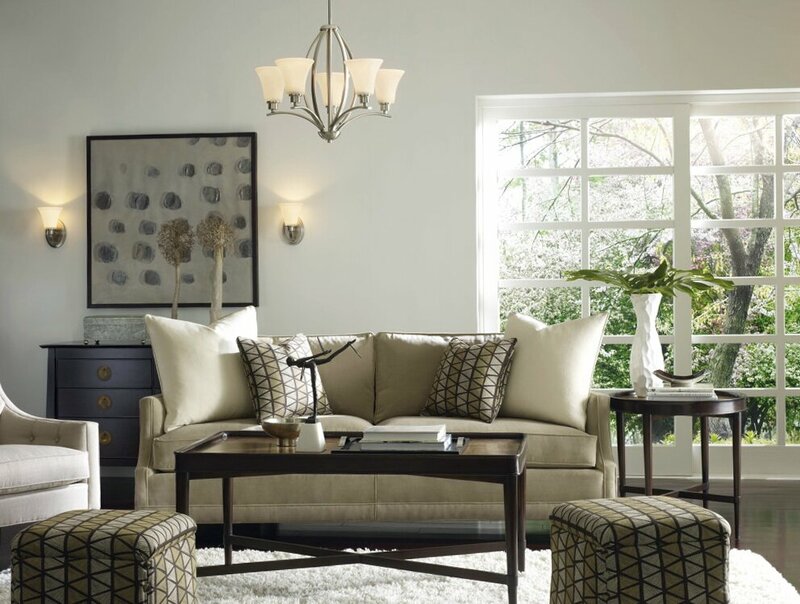 Choose the design of pendants or spot lights you want to put on them and problem solved ! If the fixture is only off by a few inches, try using a molding or medallion to cover the outlet and make it looks more flush. Another option is to use an extension to blend in the fixture from the electrical box to the light itself. At Orion - Euro Interiors, we make sure to provide the best in quality and brand, because your satisfaction is our top priority!